A grey drizzle was falling as we roared off the runway at RAF Kinloss and banked for the Irish Sea. We were passengers on one of the final flights of the Nimrod MR2, which has been Britain's spy in the sky for more than 30 years. The Nimrod was based on the very first jet airliner, the De Havilland Comet. The MR2 version took to the skies in 1981 after being upgraded from the MR1 which had already been flying for a decade. The aircraft has proved incredibly useful and amazingly versatile. From the Falklands to Afghanistan, via Kosovo and Iraq, the Nimrod operated as a radio tower in the clouds, providing secure communications for troops on the ground. In recent years it streamed live video of Taliban soldiers back to British bases. It could even spot roadside bombs by looking for patterns in the dust. But the Nimrod's real home was over water, as we discovered. The RAF had invited us to film a scenario involving a search for smugglers in the Irish Sea. The training mission began near Anglesey with the crew working their way north, taking great care to avoid Irish territorial waters. Every vessel in the sea beneath us - from a tiny yacht to a long, black and red tanker - was spotted, videotaped, photographed and identified: this was CCTV for the shipping lanes. Live pictures from a camera under the wing were fed into the Nimrod. They were incredibly steady and sharp. The operator could read the names of ships several miles away. But this was just a thin slice of the Nimrod's capabilities. For many years its key role was Cold War reconnaissance, scouring the seas for Soviet submarines and ships as well as guarding Britain's subs and their nuclear cargo. The Nimrod stayed in the skies so long because the RAF simply couldn't do without it. It kept flying even when disaster struck. On 2 September 2006 a Nimrod MR2 XV230 exploded over Kandahar, Afghanistan, after a leak during air-to-air refuelling. All 14 men on board died. At the inquest into the men's deaths in May 2008, the coroner called for the jet to be grounded. The defence secretary, Bob Ainsworth, refused. "The Nimrod is saving lives in operational theatres every day," he said. "If it was not safe we would not be flying it." 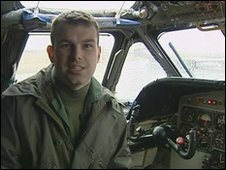 In October 2008 an independent review into the crash accused the Ministry of Defence (MoD) and its contractors of sacrificing safety to make savings. The response was to spend millions modifying the aircraft to keep it flying. And yet the official reason for grounding the MR2 now is cost. Graham Knight, whose son, Sgt Ben Knight, died in the explosion, believes that didn't make sense. and they then announce that they're not going to fly them any more? "It seems quite bizarre to me that they're grounding an aircraft that's safer now than it's ever been." It might make more sense if the MR2's replacement was ready. But it isn't. The Nimrod MRA4 is already a decade late and millions of pounds over budget. It is now due to arrive at RAF Kinloss for training in July but it won't enter active service until autumn 2012 at the earliest. In the meantime, says the MoD, the Nimrod's work will be carried out "by a variety of different aircraft" including helicopters. Privately many in the RAF insist this is just not possible. One senior officer has even told the BBC that he thinks grounding the MR2 will put lives at risk by depriving search and rescue helicopters of good overhead surveillance. And the wait for the MRA4 makes the community around RAF Kinloss, on the edge of Moray's fertile farmland, nervous. Dozens of jobs have already been lost at the base because of the withdrawal of the MR2 earlier than planned. Phil Breed, the landlord of the local pub, The Abbey Inn, sums up the concerns. He said: "If the base was to shut then the impact would be quite devastating on a lot of businesses in the community. that they were going to pull out completely so a lot of people were very, very worried." Mr Breed said he had been somewhat reassured by the RAF at a recent town hall meeting - and the MoD insists that it is committed to RAF Kinloss. But for a while at least the skies around here will be a little quieter. Before that could happen though, our Nimrod had to return to base. As the exercise had continued in the clear skies of the Irish Sea, the weather at RAF Kinloss had been deteriorating. Suddenly the pilot, Flt Lt Drew Buxton, announced that the task had been cut short. The weather was closing in back at base and he was heading for home immediately. If the fog over Moray was too thick, the Nimrod would be diverted to Prestwick in Ayrshire. If that was not available, RAF Lyneham in Wiltshire would be the final chance to land. On the first three attempts to put the aircraft down the pilots reported zero visibility. Flying blind at 200ft was disconcerting for amateurs like us - but the crew did not seem worried. They had seen it all before. On the fourth attempt there was a shout of "land it! ", followed a second later by "I have control" and in a flash we were on the ground. We hardly felt a bump. It had been a fine demonstration of the skills of the Nimrod pilot and his crew, designed no doubt to convince the public that they and their aircraft were indispensable.